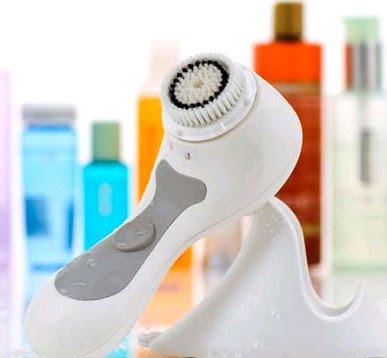 "Clarisonic is the sonic technology proven to gently yet effectively loosen dirt and oil to clear your pores. The Clarisonic Skin Care Brush uses a patented sonic frequency of more than 300 movements per second to clean, soften and smooth your skin. In just 60 seconds a day, the Clarisonic micro-massage action cleans more than twice as effectively as manual cleansing." I bought the Clarisonic Brush a while ago. The reason why I bought this brush was undeniably due to all the GREAT reviews!!! I used it consistently for a week, however I started breaking out after using it. I didn't know if it's because of the brush or because of the change in my diet during that week; so I decided to stop using it until my pimples went away. -It does clean skin well. My skin feel so much cleaner using the brush compared to just using regular facial cleanser. -Leaves skin very soft and smooth. -Waterproof. Can be used in the shower or bathtub. -Like how it claims, after cleansing, it feels like my skin absorbed the moisturizer better. -Expensive. The Clarisonic Skin Care Brush System retail at $195. Plus another $25 after every 3-4 months for brush head replacement. -Does not do much with my pores. They still feel and look the same. -Doesn't get rid of my pimples/blemishes. The brush heads all look the same. The only difference is the texture. Overall, I'm not very satisfied with Clarisonic Brush. Although it cleans your skin well, it still doesn't do all that it claims for me. But, if you have $200 to spare then why not grab one and spoil your skin. Make it feel cleaner, softer and smoother. However, I believe you can get an alternative skincare brush that's a portion of that ridiculous price and still get the same affect!!! Suit your own needs....well, in this case, suit your own wallet's needs!!! that board is fun how much was that/?? I can not photo shop if my life depends on it too many buttons and everything although I have seen what it can do to people's photo and hes amazing haha but Im just to lazy to ever retouch up my pictures.. guess thats why I have a boring looking blog.. haha but isnt the perming eye lash easy to do?? Thanks for that review. I recently started hearing about thati Clarisonic but it didn't drive me to wanna spend that much on a facial brush. I already own a DERMANEW brush and to me, that works quite well already! How disappointing! I was hoping the Clarisonic brush would work for ya! don't you just hate it when you drop a pretty penny on something and it barely works? I've been meaning to ask (and you prob get this all the time)..what is your ethnic background? aww you are soo cute! you have natural dolly-looking eyes.. very pretty! I've read raves about the Clarisonic too! gosh you are too cute Twin :) i love the Princess LALA and you can definitely pass as one gorgeous girl! I'm sorry this didn't work for you. I had heard grat reviews about it too. Your photoshop pix are so funny and cute! Thanks for the review! I've been eyeing the Clarisonic for such a long time now, but I really can't bring myself to pay that much! It's too bad it didn't help with your pimples. I have acne-prone skin myself, so I wonder if it would do me any good. Damn I have no idea what's going on with my videos! Some people say it's fine and others can't hear a thing! I actually don't always get sound either, it depends on the day! Sorry dear!!! The same thing happens to me while watching other bloggers' videos! I think it's a youtube problem.. But it usually always works on firefox for me. hahaha you nerdy elf looking hot!! !